The Acu DriveTM XS Variable Frequency Drive is designed to save energy and operating costs. It increases pump performance, resulting in energy savings up to 98 percent. Specified to save energy, space, costs and time, the Acu DriveTM XS is built to be the heart of the pump room. With minimal payback time, the Acu DriveTM XS automatically optimizes energy and offers built-in display showing time remaining until the drive plays for itself. The new Hayward Commercial Universal H-Series ASME gas heaters deliver exceptional performance, reliability and best-in-class hydraulic efficiency, with up to 18 percent in energy savings. The flagship of the H-Series line encompasses all high-end features and construction materials as standard, including the patented Cupro Nickel heat exchanger with bronze header. Flexible connection options make them ideal for new or existing applications while the electronic feature prevents unauthorized access to configuration settings. Pool Blaster PRO is the first cordless rechargeable pool vacuum designed with the pool maintenance professional in mind. 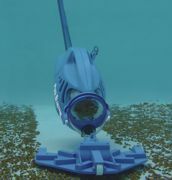 Like the popular Pool Blaster, the Pool Blaster PRO version features a high-volume internal filter pump, an on-board filter bag and a rechargeable power pack built for the "big boys," giving professionals more than three times the cleaning time per charge, three times the filter capacity and twice the vacuuming strength. GameTime can help you plan the perfect water play area, whether you want a complete sprayground or just an awesome waterslide for your local community center. The GTH20 line offers innovative spraygrounds with quality workmanship and first-rate customer service, and GameTime recently partnered with AquaBlue International to offer a complete line of premier waterslides, both large open and closed flume, as well as smaller pool slides. Delta UV Corp. designs and manufactures UV systems for the commercial and residential pool and spa industry. Delta UV provides an alternative to potentially harmful chlorine with the most complete water purification NSF-50 product range in the industry. The company is based in Los Angeles. The most highly insulating, diffuse-light-transmitting system for enclosing pools is also the ultimate in energy efficiency with insulation values as high as R-20. Factory pre-finished, corrosion-free, pre-engineered aluminum box beams form a total composite building system with Kalwall® translucent sandwich panels. A screened, retractable roof system allows for fresh air and an outdoor swimming experience without bugs, leaves or other debris. Siemens' ultraviolet systems are proven to deliver fast, reliable, economical and environmentally friendly disinfection. The Barrier® M medium-pressure UV systems are particularly effective for the removal of chloramines in indoor swimming pools and offer significant improvement of air quality. The system provides a powerful disinfection solution without forming harmful disinfection byproducts and controls waterborne pathogens such as bacteria, viruses and parasites, including Cryptosporidium or Giardia. SCS Interactive introduced HydroLineTM water play structures. Ideal for municipal aquatic centers, parks, campgrounds, hotels, waterparks and resorts, it provides fun for all ages, is completely stainless steel and components require minimal capital investment, low operating costs, minimal supervision and include a five-year warranty. Available in standard or custom theme options, HydroLine allows SCS to offer customers a true waterpark experience with interactivity, climbable structures, tipping buckets and iconic elements in a small package.